We present here a Scanning Near-field Optical Microscope working in reflection, coupled with an Atomic Force Microscope(AFM), using an apertureless metallic tip. 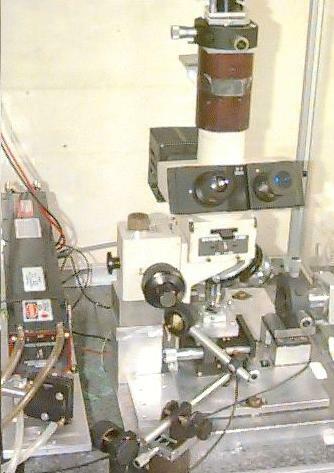 The experimental set-up is built around a commercial microscope which allows observation and micromanipulation of the tip and the studied sample. We use a conical tungsten tip that we prepare by electrochemical erosion of a bent tungsten wire. The radius of curvature of the end of these homemade tips is smaller than 20 nm. The tip is attached to a piezoelectric translator which excites it at its resonant frequency, with an amplitude of about 100 nm, and periodically and locally perturbs the reflected/scattered near-field at the sample surface. Lock-in detection provides the SNOM signal, and an optical image is obtained by scanning the sample surface. The interaction of the tip with the atomic field of the sample allows us to keep the sample-probe distance constant during scanning by a feedback loop, the output signal of this loop provides a topographical AFM image of the sample surface. In our previous set-up, the irradiation and the collection through the commercial microscope were axially symmetric. SNOM images were obtained in the visible region, with a very good resolution of about 15 nm (~l/50). Infra-Red(IR) spectroscopy is a widely used tool in semiconductor or polymer physics, so the extension of the SNOM for this region of spectrum is very promising. Slight modification of our previous set-up was implemented to work in the IR region, the new experimental set-up operates under a grazing incidence. The scattered IR flux from the tip in local interaction with optical and topographical properties of the sample is collected in the normal direction to the sample surface. We present the first SNOM reflection images in the mid IR region at l = 10.6 �m with lateral resolution close to 17 nm (~l/600). This resolution is similar to that obtained in the visible region, which allows us to conclude that our SNOM resolution does not depend on the wavelength of the light but is imposed by the tip size. Topographical and IR SNOM images of 500/1000 nm Au/Si grating.